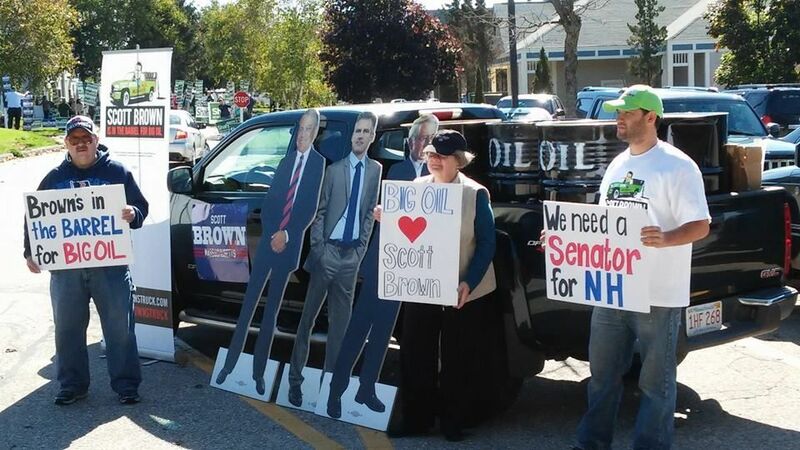 Last week during the Shaheen-Brown debate in North Conway, the environmental group NextGen Climate set up a display to draw attention to Brown’s ties to big oil. Politifact NH has looked into the claims made by the democratic supporting PACS, in particular Senate Majority and finds the claims true in that Brown does in fact receive a large portion of his funding from big oil and gas. Of course to most people who pay attention this isn’t really big news since big oil and gas have always supported GOP candidates and races far more than Democrats. Mostly due to the Democrats long standing tradition of standing up for and funding regulation for healthy people and communities. While big oil fights government support for renewable energy development, the gas industry has been working double time to ensure continued support for fracking. The degree to which the oil industry has chips to cash in with New Hampshire politicians should be of concern to residents as the north-east’s dependency on oil is greater than any other part of the United States. Residents want other energy alternatives but without prioritizing government funds for subsidies or credits for such development, the dream of energy independence cannot be realized. Geo-thermal and solar, two of the most important renewable energy opportunities still remain far out of reach of most residents and businesses.